Each of our individual Learning Landscapes is different: we come with different knowledge, context, ability, and motivation, amongst a host of broader pressures. I thought it was worth exploring a few of these: my motivation being that, as we consider Organisational imperatives and contexts of learning design and delivery, it’s all too easy to forget that learning is, at least at point of consumption, always grounded in the individual. In any applied context, Individual Agency is key: the ability to do something with, or about, the things that we learn. And that Agency is constrained or enabled by the personal gradients of consequence and power that we inhabit. Gradients of power are one of the most fascinating lenses through which to consider the reality of Organisational life: power as experienced within the hierarchy (your position within the system), and power as experienced within your community (social norms and dominant narratives e.g. narratives about maternity leave, millennials, or diversity). Your own Landscape of Learning is inherently about your ability to understand this context, and to operate within (or around the edges of) it. In the context of the Social Age, learning often takes place within the arms of your Community: communities being our primary ‘sense making’ entities, the spaces where we contextualise and share our understanding and interpretations, and our own learning narrative. ‘Community’ is more than just ‘space’: it’s more than your LMS, it’s the networks of trusted tribal structures, and both hidden, and visible, learning spaces. The way we are, the ways that we act, and learn, within these communities, forms the foundation of our Social Authority, and hence reputation. One context of learning is… our broader context: your everyday grounded reality is very different from mine, and that context is central to learning. Those things that are essential for your understanding, or ability to perform, maybe peripheral, or irrelevant, to mine. Although equally, your context and mine may be similar, even though we are separated by a high degree within the formal or visible system. We may have more to learn from each other than we at first realise. 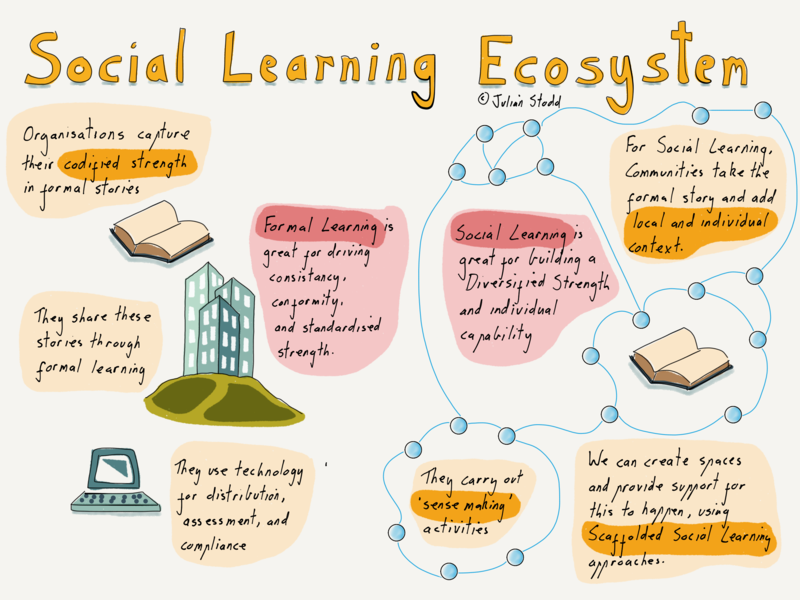 With all the focus on technology, it’s important to remember that we each inhabit segregated, and diverse, ecosystems: the majority of technologies that we use to learn are not formal, but rather informal, social systems. Often systems of curation, sharing, and reward, that blend around the edges of formal systems. Alternative spaces to inhabit, beyond sanction or control. No amount of ‘understanding’ which spaces people are in will help us, if we seek to use that knowledge to control behaviour: better to move to where the learning really is, than to seek to subvert and control it into coming closer to where you have built your palace. Recently i’ve been describing how Organisations need to look beyond the currency of money, into other parallel spaces: it’s likely that the Socially Dynamic Organisation will run on currencies of investment and engagement. Currencies of trust, pride, gratitude, respect, and purpose. These already form much of our personal context: nobody ever judged friendship by money, it’s already held in a parallel currency. Many aspects of the Social Age diversify the economy more widely, even within Organisational life. Formal position, and structural budget, no longer automatically confer the same power they once used to. This entry was posted in Learning and tagged Community, Context, Currency, Learning, Learning Technology, Power, Social Learning. Bookmark the permalink. PS – I am curious, do you ever post a list of what you might be reading? or articles that help form thoughts? Thank you.